Synergy Vision is proud to announce that Corinne Whitehead, a veteran who has been with the agency since its inception, has been promoted to the Head of Asia-Pacific Region. Corinne will continue to lead the office in Australia, which she has helped grow from an office of one in 2015 into the fastest-growing division of Synergy Vision today. It’s a long way to go – and not just the 16,983 km from London to Sydney. Twelve years ago, Synergy Vision was a two-person agency with a clear vision to deliver a difference with its approach to excellence in medical communications. Since then, CEO Ffyona Dawber and the team have established offices in London, Dublin and Sydney, developing an equally global network of clients along the way while staying true to the vision. At the same time, Synergy Vision has retained its entrepreneurial spirit, a focus reflected by surveys of the team and apparent in feedback from clients. 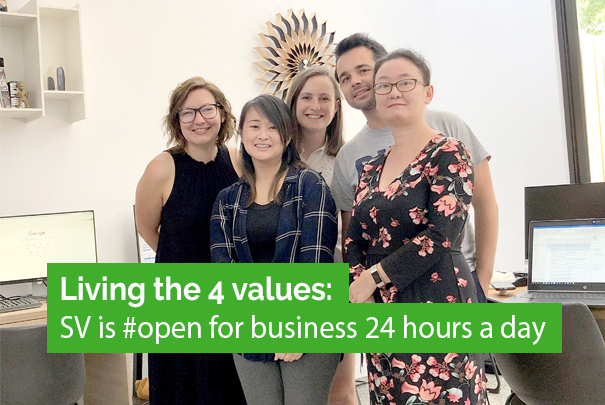 The success of Synergy Vision’s Australian office and subsequent expansion within the Asia-Pacific region reflects the agency’s commitment to delivering a local and personalized approach to medical communications – with the added benefit of being open for business 24 hours a day. Corinne has been with Synergy Vision since year one, when she joined the company as an account manager. Since then, she has worked her way through the ranks, shaping and championing Synergy Vision’s core ethos of innovation and openness with clients. Having Corinne at the helm of the agency’s growing footprint in the Asia-Pacific region will undoubtably strengthen Synergy Vision’s reputation in these exciting new markets. Long distance and the London office’s 4-day work week aren’t going to dampen inter-office communication. To meet the challenges of coordinating the shorter work week and an 11-hour time difference, Kate Herring, a Senior Account Manager at Synergy Vision spent February in the Sydney office to support new-staff onboarding. “Having worked closely with Corinne throughout my time at Synergy Vision, it was great for us both to collaborate on implementing the operational and cultural details that make Synergy Vision such a good place to work,” says Kate. “Building such a relationship with our new colleagues in the Sydney office is a positive reminder that we are an integrated team, here to support each other”. The Asia-Pac growth and secondment follows on from other team-focused initiatives, including the 2019 graduate development programme. Synergy Vision’s achievements in this arena have been recognised by the Great Places to Work® Institute and recently earned Excellence in Wellbeing status.